GA Sheriff welcome sign: "If you kill someone, we might kill you back"
If you kill someone, we might kill you back. Our citizens have concealed weapons. If you kill someone, we might kill you back. We have ONE jail and 356 cemeteries. Enjoy your stay! Harris County Sheriff Mike Jolley told the Washington Post that concealed carry permits have tripled in Harris County over the past several years. He told the Ledger-Enquirer that he changes the signs that are posted outside of the Sheriff’s Office every seven or eight months. This one is another “politically incorrect” sign. 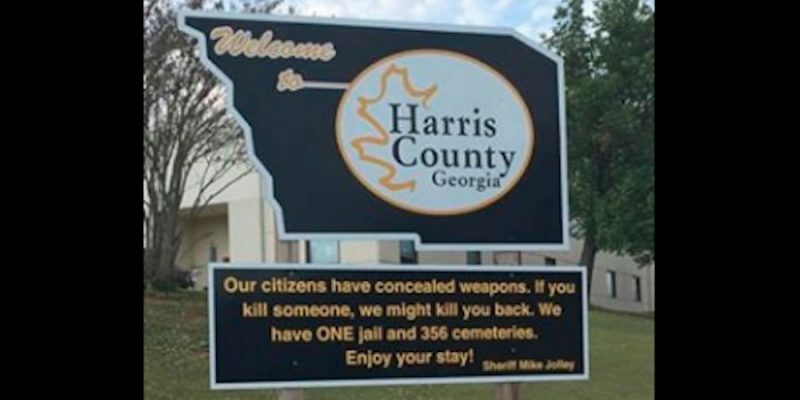 THIS SIGN IS REAL…Once again our local Harris County, Georgia Sheriff Mike Jolley sends out another loud & clear message about our citizens & you better believe this! WARNING: Harris County is politically incorrect. We say: Merry Christmas, God Bless America and In God We Trust We salute our troops and our flag. If this offends you … LEAVE! Sheriff Mike Jolley and the new sign at the Harris County Sheriff's Department. We couldn't agree more sir!